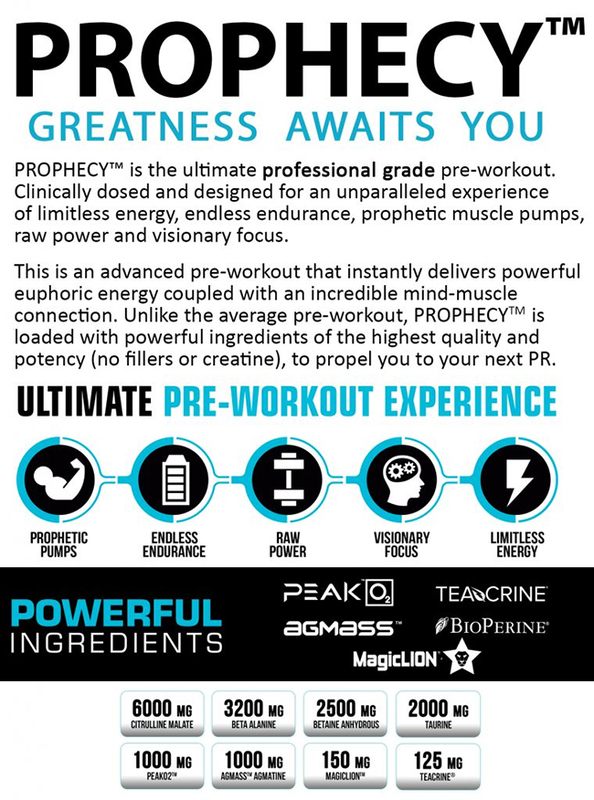 Prophecy™ combines the scientific power of clinically dosed ergogenic ingredients to deliver the ultimate performance experience. Elevate nitric oxide for incredible muscle pumps; revel in the explosive power; relentless focus, superhuman endurance, and boundless energy. Unleash your untapped potential and fulfill your own Prophecy™. Citrulline Malate (2:1): L-Citrulline is the 'pump' amino acid, it has been clinically researched to enhance nitric oxide levels better than arginine. Studies suggest that citrulline increases the rate of ATP synthesis during exercise and greater phosphocreatine recovery after exercise. Citrulline also reduces lactic acid and ammonia levels, which leads to better muscle performance and increased endurance. Beta-Alanine: A non-essential amino acid, beta-alanine combines with the amino acid histidine to form carnosine. In muscle cells carnosine buffers against the hydronium ions and lactic acid which form during exercise and can lead to muscle fatigue. Supplementation with beta-alanine can improve strength, endurance and enhance recovery. Betaine Anhydrous: Also known as trimethylglycine, this amino acid analogue helps reduce homocysteine levels in the body and stimulates production of creatine in muscle cells. Betaine can act as a methyl donor and prevent dehydration of cells. As a supplement betains can also amplify power output and training volume. Taurine: Taurine has several physical and mental benefits including enhanced cognition, as well as improved aerobic and anaerobic performance. By maintaining proper taurine levels, one can increase muscle strength, enhance power, reduce muscle damage caused by exercise and accelerate recovery between workouts. PeakO2™: is a powerful blend of six organically sourced, natural adaptogen mushrooms that enhance physical endurance. PeakO2 has been clinically proven to improve the maximum volume of oxygen athletes can use over a period of time (VO2 max) while helping them use that oxygen more efficiently. In a recent study, athletes using PeakO2 improved their peak power output 17.6% over baseline in only 7 days! And in another 21-day clinical study at UNC, PeakO2 users improved their cycle time to exhaustion by 70s from baseline! AGMass™: This trademarked form of 'green' agmatine sulfate is not chemically synthesized, rather derived by fermentation, making it the highest purity material available. Agmatine has several functions in the body including: amplifying nitric oxide production, stimulating the release of catecholamines, increasing GnRH levels and even potentially testosterone levels. L-Tyrosine: The amino acid L-Tyrosine is an important precursor in the production of epinephrine, dopamine and norepinephrine. These hormones contribute to elevated energy, mood and mental alertness. Caffeine: Caffeine is a powerful mental stimulant. It combats fatigue and can promote increase alertness and energy levels. 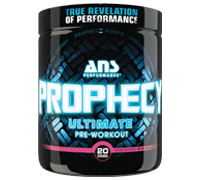 1 full scoop of Prophecy is loaded with 400 mg of caffeine, definitely not a 'beginner' dose. Choline Bitartrate: is a great source of choline, a key precursor to the neurotransmitter acetylcholine - the key signaling molecule that stimulates muscle contraction, which supports muscle movement and performance. The brain also uses acetylcholine communicate between it's cells - choline is critical for cognition, memory, sleep and maintenance of physical balance, stability and mobility. Coconut Water: A natural source of electrolyes that offer replenishment during harsh training sessions so you can demand the most of your body, without worrying about cramping up or failure. MagicLION Lion's Mane: is a specialized extract of Hericium erinaceus, commonly known as Lion’s Mane exclusive to ANS Performance. Lion’s Mane is a powerful traditionally used Chinese medicine containing the triterpenes known as hericenones and erinacines. These compounds, found in the fruit body and mycelium, that are considered to be responsible for the neuro-regenerative effects of this species. Teacrine®: This trademarked form of theacrine is a potent stimulant which reduces fatigue and increases mental and physical energy. Teacrine® also improves the ability to focus, enhances mood and motivation, and acts as a powerful antioxidant. Its chemical structure is similar to caffeine, however it's considered superior in its effects since studies have found that humans do not build up a tolerance to Teacrine®, like caffeine. Hordenine: a natural promoter of energy enhancement due to its adrenergic properties. Hordenine occurs naturally in barley seed, and can affect nerve cells, causing them to release neurotransmitters like epinephrine and norepinephrine. 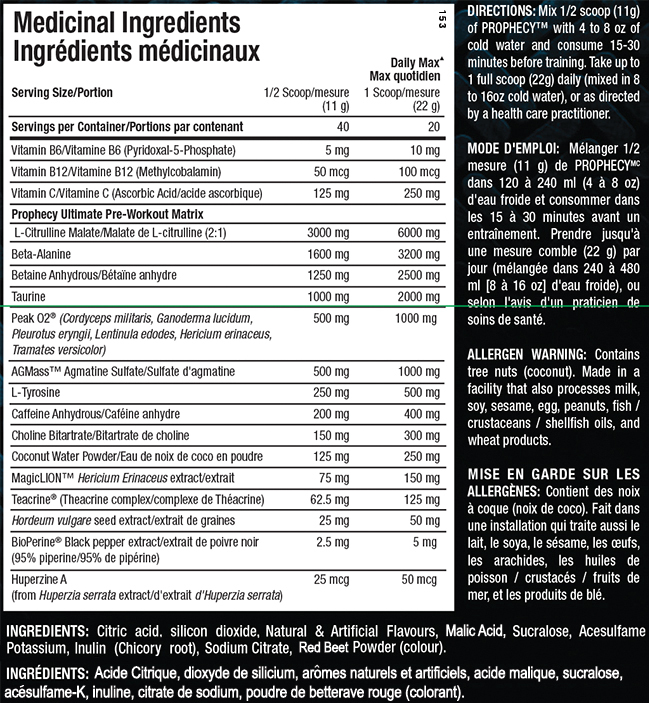 BioPerine®: is a patented extract obtained from black pepper fruits standardized to a minimum of 95% Piperine. BioPerine® has been used as a bioavailability enhancer for over 20 years. BioPerine® is often co-administered with various nutrients to enhance their bioavailability and absorption.